Who’s Coming Up on Monday February 26? 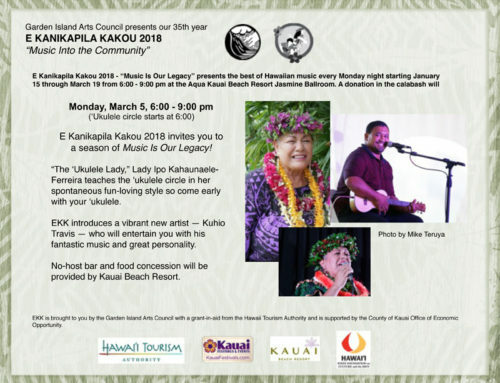 Ku’uipo is no stranger to EKK; she has appeared at EKK more than any other artist (except Dennis Kamakahi who performed 15 times); in 1998, 2000, and 2001 at the Saint Michael’s Church; in 2002 and 2004 at Island School, and most recently in 2015 with the Hawaiian Music Hall of Fame Serenaders. That performance was really significant because they shared the songs of Na Lani Eha in a very professional performance. This year’s performance was over the top. She’s the real deal in Hawaiian Music. but this year seemed so free, candid and really fun to reflect on my life and share. In the past I was going through life now i can kind of talk about it all – if that makes sense at all. I guess I coming Kupuna. The audience was super as always. Congratulations for 35 wonderful years. I was in my late 30s early 40s when I first played at EKK at the church – I’m going to be 60 this year OMG!! How time flies. She put on an awesome show . . . so passionate . . . so hilarious . . . so relaxed and yet so powerful. She internalizes her Mom’s advice, “You got to put a lot of love in what you do.” She pours her heart into every song, creating a different mood each time – sometimes grand, sometimes tender, sometimes sassy and animated, sometimes totally out of the box. She’s so versatile and each song is a whole act complete with stories, messages and entertainment. 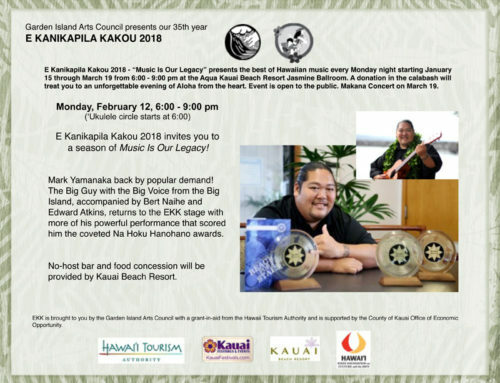 Her songs were interwoven with stories of her Daddy and Mom, Samuel and ‘Ululani Kumukahi, whose influence on her musical development is undeniable and evident in the way she performs. Our resident henna-colored hair Brit, Jodi Ascuena, originally from Newcastle, England and now from Koloa town, introduced our artist in ‘Olelo Hawai’i, summarizing Ku’uipo as a champion of traditional Hawaiian songs and culture. She is not just a singer or performer; she is a person who sings as if her life depended on it. At least the life of her Hawaiian people. I was expecting GOOD but I got GREAT instead and so did everyone else at EKK. She sang the Aloha Chant which speaks of the Hawaiian attributes that make up ALOHA and ended as a chant. Ku’uipo was mesmerizing as she took us around Hawai’i Island in a musical tour of places captured in songs. Her selections were skillfully woven together with candid stories about her namesake Daddy and her wise caregiver Mom who attentively nurtured Ku’uipo’s late-starting but long-lasting musical career. She acknowledged her musicians and admitted how nice it was to play music with such great guys. Doc Isaac Akuna on steel, Kauai’s Kekai Chock on guitar and Daniel Kiaha on bass. They not only kept up with her spontaneity and wide spectrum of song choices, each musician is so talented. 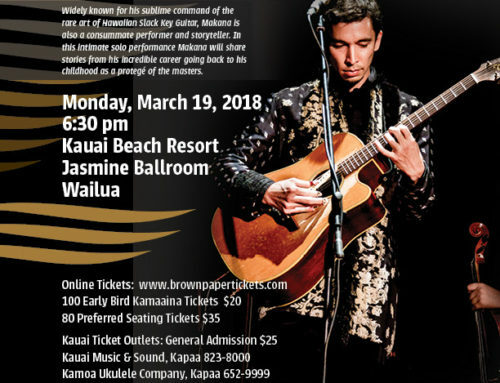 To acknowledge a rare gift of a maile lei from Auntie Julia Kapahu, the “Sweetheart of Hawaiian Music”, as Kuuipo has been called, sang Aloha Kaua’i. How fitting a name for this extraordinary musician with the voice of an angel. Residents of each island are proud of their name, proud of their home town, proud about everything unique about where they live. To show this pride, she launched into a bombastic Hilo – My Home Town by Betty Lou Leilehua Yuen. “Hilo is a sleepy town; the stores open at 9:00 and close by noonbecause we got places to go. There is no more traffic, no more freeways, no more rail … we got a lot of forest to disappear into.” Hilo was home to many, including Queen Kapi’olani. It was also the last residence of Prince Jonah Kuhio Kalaniana’ole. Speaking of Royals, she visited the Prince Kuhio Park today and pointed out that Kuhio was the only US Congressman of Royal descent. He was responsible for the Homestead Act to insure that Hawaiians would have a place to live and started the Hawaiian Civic Clubs to insure that Hawaiians had a voice in self-governance. To honor Prince Kuhio she sang the beautifully melodic Keaukaha by Albert Nahale’a, a Commissioner of Hawaiian Homelands. As she sang the Hawaiian lyrics, she narrated the English translation. Vern Kauanui, our resident hula dancer, stepped up to the stage wearing his many strands of Niihau shell leis and danced an elegant hula that described the lyrics of the song. This song comes from the family of John Mahi. Continuing the island trek, she pointed out that Tutu Pele made a lot of new land in Puna. Her first bar gig at age 15 was down in Kalapana. “I was a big girl so no one bothered me in the bars.” Whenever Ku’uipo went out to sing on a gig, her Dad drove her to the event, but she could never figure out where he disappeared to while she was singing. Her mother cautioned her, “You watch what your Daddy eats. If he don’t eat it, you don’t eat it.” In those early days it was common to be asked to play for six hours . . . “and we will feed you.” When her Mom asked her where her Dad went, she said she did not know, so she ended up not eating anything. Eventually, they discovered that he would join others who met in the back of the hall, not necessarily guests at the events, where they could freely speak their native tongue without fear of repercussion. Because of the early missionary influence to squelch the Hawaiian language and keep the Hawaiian people from speaking or teaching their native tongue, even as adults they had to hide to speak Hawaiian. Her Dad, being a manaleo(native Hawaiian speaker), spoke only Hawaiian until he was about nine or ten years old. When he moved to a different town, he was a novelty among his school mates. At home he never spoke Hawaiian to Ku’uipo because of his need to learn to speak English. Later in life he used a hearing aid but it turned out the only thing he could not hear was English. However, whenever Puakea Nogelmeir calls on the phone, they are speaking Hawaiian on the phone for over three hours … like young girls. According to mythology, Tutu Pele was angered by Chief Kumukahi for not allowing her to play in the royal games, so she chased the Chief out to the ocean with her lava flows. Tutu Pele was cleaning house by sending a lava flow to that area. In the 1960’s the residents built dikes to stop the flow to no avail. The Cape Kumukahi Lighthouse at the southeast of Hilo was in the path of the lava flow. They sent his wife and infant child to safety, but the lighthouse keeper did not want to leave the lighthouse. Miraculously, the lava came to within a few feet of the lighthouse, split into two streams and came back together, sparing the life of the lighthouse keeper Joseph Pestrella. The song by Grace Kenoi McBride and Jenny Ka’au’a was titled Kumukahi. What a rare treat to hear a song we never heard before and sung in her lower register. Isaac Akuna’s pa’ani with the steel guitar added the nostalgic and mournful mood of this event captured in song. Many places are gone, but the memories remain. “As long as we keep singing these songs about the places and the events that took place in Hawai’i, we will not lose the history of our islands because they are all recorded in our songs; songs like this keep these places alive,” said Ku’uipo. After Puna, we are moving on to the Ka’u desert. When one drives around the island, you cannot help but feel like you are leaning to one side. That is because you keep your right shoulder to the mountains and your left shoulder to the ocean as the main road pretty much follows the shape of the island. Her family often drove to South Point where there was no water and no shade anywhere. She never asked her father where he was going as it is a well understood Hawaiian custom that you never ask a Hawaiian where they are going . . . you just follow. It’s bad luck especially if they are going fishing. Often when she wanted to swim, everyone was called to remove the fish from the nets because that was going to be their dinner. She touched on the sensitive topic of the lua when camping and assured everyone that she could handle that. She is hilarious. The island tour left the Ka’u district and moved westward toward Kona. A unique feature of this area is that on the Hilo-side of South Point the ocean is very rough and on the Kona-side of South Point, the ocean is very calm and turns very dark blue. Kona Kai ‘Opua is about the clouds that sit low above the ocean. She started with a rhythmic tempo, then on to a very slow melodious version and then on to a very playful, light-hearted sound and then into a faster swing-like beat. I never heard anyone sing this song quite like that. Her father was a road inspector working with the traffic division; his last project was the Keahole Road through the 32-mile stretch of dark black lava fields that stretch from the Kona Airport toward the Kawaihae Harbor. This highway made accessible beautiful beaches that attract surfers, vacation rentals and grand hotels. The song that spoke about this South Kohala area isPaniau. It’s a song by Helen Desha Beamer composed for the beach home of Al and Annabelle Ruddle at Puako. As she continued moving out of Kona to the north side of the island, watchdog Milton Chung reminded her that she had skipped singingKalapana. For sure! So she went in reverse, passed Pahala and returned to the famous place called Kalapana, an area where Tutu Pele’s wrath wiped out the entire community. We hear often about Kalapana because that was the family home of well-known musician Ledward Kaapana and his Uncle and mentor Fred Punahoa and also the Queen’s Bath. Although the community is no longer there, memory resides in the beautiful songs that speak of the places we wish to keep alive. Back on the upward journey toward windy Kohala at the northernmost tip of Hawai’i Island, Ku’uipo chose to sing about the strong and constant winds that sweep over the lush green area where Kohala town sits. Maika’i Ka Makani o Kohala captures the spirit of the place as it sounds like a rallying song. Very fitting for a place where time stands still and the community keeps its customs and traditions with fierce determination. Driving past Kohala is the place that Ku’uipo’s father always stopped. It’s the paniolo district of Waimea or Kamuela where the famed Hawaiian Cowboy Ikua Purdy and his entourage of cowboys from Hawai’i took the World Championship Rodeo in Wyoming. Ku’uipo sings Kilakila Na Rough Rider in a way that only she can. You can’t imagine how she manages to play the guitar, sing the tongue-twister song, heave the lasso, give the cowboy whistle-yeehaw, and dig her stirrups into the horse . . . all at the same time . . . wearing a bright colorful red and yellow mu’umu’u. She never misses a beat and she surely ropes that steer. You need to see her in action; it’s hilarious but at the same time quite amazing! Her father was not a cowboy but he was a Happy Camper who knew how to survive off the land. He once caught her a baby pig when a sow crossed the highway followed by her piglets. After the pigs crossed the road, he called the piglets back, picked one up and took it home to Hamakua for Ku’uipo to raise. When she asked him how they keep warm out in the night cold, he told her to dig an imu with hot rocks in the fire, covered by a thick blanket of banana stalks and ti leaves, and lie down on the warm green layer surrounded by the dogs. Not sure I want to try it but good to know. From cowboy country in Waimea, we kept driving right into the Valley of the Kings in the famous Waipi’o Valley where the mystical Hi’ilawe waterfall provides a secret meeting place for lovers to escape from the gossiping neighbors. Ku’uipo’s incredible voice soars while singing Hi’ilawe; the lovely Po’ai Galindo takes the stage and brings the beauty and grandeur of the waterfall to life with her swaying hula and fluttering fingers. Interestingly, Ku’uipo sings this song with the Tahitian T sound instead of the Hawaiian K sound so it sounds different from the same song sung by other musicians. Water is an inspiration for many composers. Ku’uipo says that her Daddy is not a poet but it did not matter because Hawaiian was his language and he wrote a song about the life-giving waters. It captured the unique beauty of their 25-acre family home of 160 years. It’s a place where the vi, or kupe’e, was once plentiful in the mountain streams. No more. She sang her father’s ‘O Waikulumea in a truly heart-felt “chicken skin” manner. As we came around full circle back to Hilo, the same loud voice from the audience called out that we can’t pass Hilo without Akaka Falls. 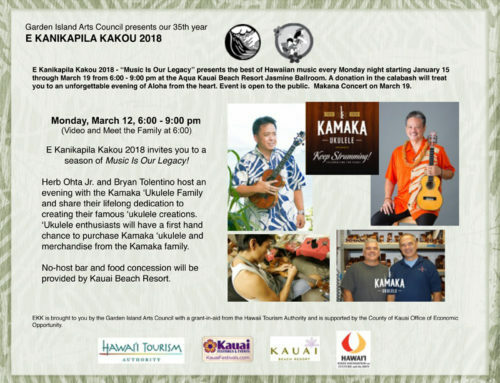 Apologizing in advance to Darlene Ahuna of Hawai’i Island who is scheduled to appear next week at EKK, Ku’uipo gave an emotional and powerful version of the song about the famous Hilo waterfall. Vern Kauanui could not resist an elegant hula about the waterfall. Gorgeous! We took a quick island hop to Kaua’i. She called on Danny Kiaha to sing a song about Hanalei. His sister, who he had not seen for a while, came up to dance a hula about their home. What a treat to see a new Kaua’i dancer at EKK. The big surprise of the evening that brought the house down was her unexpected slam-dunk version of Skippy Ioane’s Kuka’ilimoku Village with the words ‘Onipa’a hanapa’a kulike kakou. Wow! She growled the song so passionately, you could not miss her message. Ku’uipo asked that we all speak the truth about Hawai’i. It’s a special place with very limited resources, so we all need to be cautious about what happens to our home; otherwise we will lose what we cherish most about Hawai’i. As a youngster she went to Zales Jewelry at the mall where she would see many gold Hawaiian bracelets, each one engraved with the word Ku’uipo. She asked her mom why she was given such a common name that everyone else had. Her mother assured her that she was given the name because of the immense love that they had for her. She doesn’t use her English name much because she was named after her Dad, Samuel Kumukahi. “Why was I named after Daddy?” “Because you two are the same.” No, it was not Samuela! At least she got a feminine version — Samie Ku’uipo Kumukahi. Whatever handle she goes by, she is best known for her remarkable versatility and power in her performances. Never have I seen Ku’uipo work the stage as she did tonight. She is truly in a Class All Her Own.